Attacq the Future is an initiative Attacq presents in collaboration with its regional malls located in Stellenbosch, Potchefstroom and George. It affords six grade 11 learners the opportunity to visit this JSE-listed entity in Gauteng. A spokesperson for Attacq says the company invests in the development of South African youth, through education and training and continues to develop others beyond its own bottom line. Attacq the Future’s goal is to grow the young leaders of tomorrow and to expose them to big corporate structures, the business environment and career opportunities associated with it. The initiative also aims to showcase Attacq to young inspirational individuals as a market leader in the real estate sector. 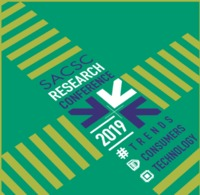 This initiative is presented in co-operation with the Attacq Group’s regional malls in George (Garden Route Mall), Stellenbosch (Eikestad Mall) and Potchefstroom (MooiRivier Mall). “Learners are awarded the opportunity to attend the financial results presentation of a listed company and to learn from top executives how the JSE works. Learners are also afforded the opportunity to have meaningful interaction with Attacq’s executive management in order to develop a better understanding of what the various roles of a listed company’s top management require. During the visit, students interact with staff from different departments to equip them with a broad understanding of big corporates and the various career opportunities that may be available to them later in life. It inspires the learners to ‘attack’ their future with excitement. They gain insight into the history of the JSE and how JSE listed entities, like Attacq, succeed to flourish within this dynamic business environment,” says Danny Vermeulen, Attacq’s empowerment specialist, who has been involved in the programme since its inception in 2015. “The programme prioritises academic performance and leadership. As a result, the general managers of the various malls approach the principals of surrounding schools to nominate the top achievers who meet these requirements. The nominated candidates write letters to motivate their participation in the programme. The general manager of each mall then selects two learners to participate in the programme based on their motivational letters,” Vermeulen explains. Ilanika du Plessis (Eikestad Mall) accompanied the learners on their visit. According to her it was insightful and satisfying to see how the learners enjoyed the experience. “It was extremely informative – the learners saw the corporate world from a different perspective and were exposed to various career opportunities. Eikestad Mall is a community centre and it’s important for us to give back to the community,” Du Plessis explains. According to Geraldine Frans from the Garden Route Mall’s centre management, it was a wonderful experience and an honour to accompany the learners. “This Attacq initiative gave me a better understanding of the business environment I work in. The learners regularly mentioned how this was a once in a lifetime opportunity and couldn’t stop talking about the impact this programme will have on their lives,” recalls Frans. “When you give people the necessary exposure you contribute to the creation of their dreams and ideals. We have lots of underprivileged people in our region. As a result, we take hands with more than 20 organisations and article 21 institutions to support the people in various areas. A ‘Charity Corner’ in the mall provides exhibition space free of charge to people who are in desperate need of it,” says Rion Olivier, Garden Route Mall’s general manager. “MooiRivier Mall is recognised as a respected and well-known brand among the Potchefstroom business community. Therefore, it is very important to us to invest in the community that supports us on a daily basis. The Attacq the Future programme gives us a platform to invest in the future of our Potchefstroom youth and to hopefully make a difference in someone’s life,” says Maritsa Wiggill, MooiRivier Mall’s general manager. The highlight of the experience for most of the participants was the Waterfall City tour, as well as their visit to the Schneider Electric head offices, located in the recently completed Allandale building. The learners were in awe of the design and scope of this modern, four- storey building and the balance created between a formal work environment and social environment. The building has several green design elements that conserve energy and that showcase a commitment to sustainable development. 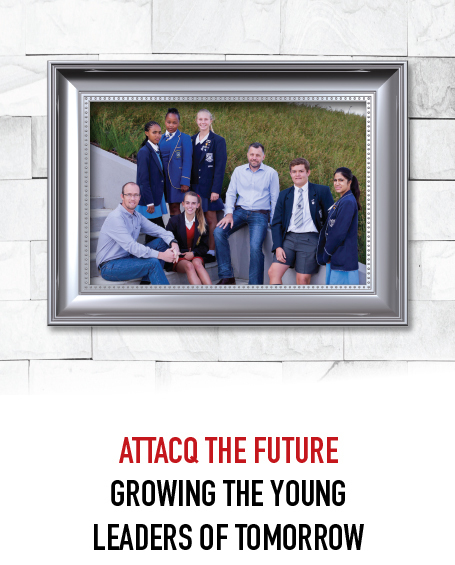 “The programme confirms that Attacq is dedicated to the three pillars the business is established on, namely invest, develop and grow: Attacq invests in South Africa’s future leaders and shifts learners’ attention towards their skills development potential that allows them to grow as individuals and as future leaders,” Vermeulen emphasises. “We are proud of our investment in various development initiatives,” says Wilken. In addition to Attacq the Future, Attacq supports Columba, Bright Kids Foundation, Bana ba Rona Early Childhood Development Centre, the Property Point enterprise development programme and has also extended its support to inner city charity MES with a focus of its support on youth development and education support,” says Wilken. Although Jordan Dowd from Rhenish Girls’ High School in Stellenbosch would like to go and study medicine, she admits that accounting is one of her strongest subjects. As a result, she would also like to investigate this as a career avenue. “The word corporate sounds so intimidating, but the environment is more people-orientated than I had imagined. I enjoy working with people and would love to work for Attacq. The highlight of our visit was definitely the Waterfall City tour. The amount of consideration they have put into the design of this safe and user-friendly city, is remarkable,” she says. Zizipho Mngcekulane from Thembalethu High School in George really wants to make a difference in other’s lives. “I want to pursue a career that allows me to contribute to community development and upliftment and to create job opportunities. Waterfall City was incredible and an inspiration that encourages me to work hard to realise my dreams,” says Mngcekulane. Dawie Röntgen from Potchefstroom Gimnasium would like to pursue a career in accounting and wouldn’t think twice about going to work for Attacq after he finishes studying. “I would definitely like to work for this excellent company, as it is a very interesting working environment. Waterfall City is lovely and you don’t realise the intricate planning that the design of such a city requires. Our visit to the Schneider Electric head offices was my highlight. I can see how this calm and contemporary environment can be attractive to employees,” Röntgen says.